Organizing can get surprisingly expensive…! It's no wonder, seeing as there are entire stores nowadays dedicated to organizing solutions and tools. The Container Store, IKEA, Crate & Barrel, and even Target offer some really great (and beautiful) options to help organize your home and your life. But you know how it goes: one trip to the store and you've somehow blown through $350. 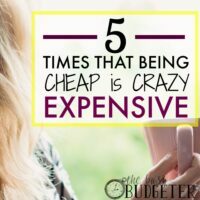 These stores can be downright dangerous for your budget! How about organizing your all your “life stuff”? 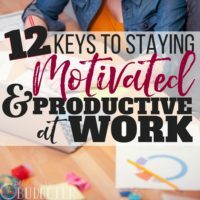 You can spend a small fortune on a beautiful planner, the stickers to decorate it, and the gorgeous customizable tools to make it personalized and really work for you…only to find that spending all that money wasn't the most effective way to motivate yourself to become more organized. So yea, sometimes spending money to organize your home and your life can actually leave you MORE overwhelmed and further in debt. Have you ever run to the store and spent a bundle on cute crates and boxes and special hangers, but when you brought it all home you realized it’s just another layer of stuff to stuff in your already full closets? Yikes! 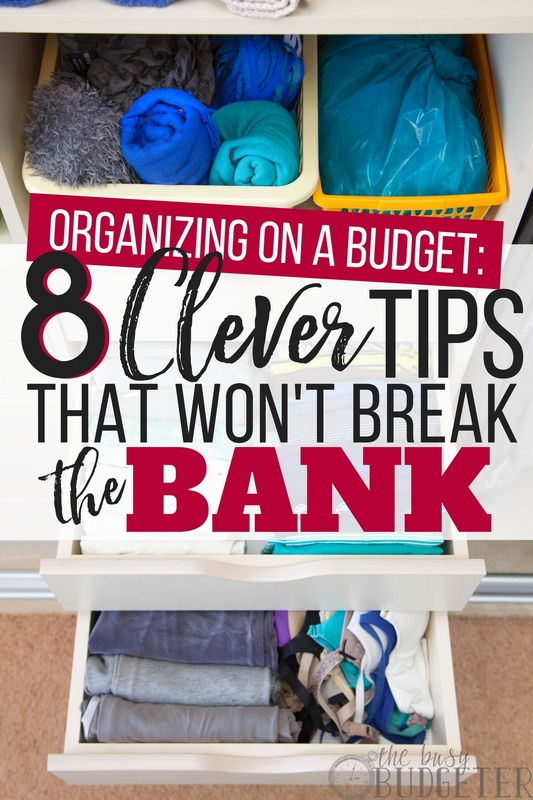 If you’re looking for basic organizing tips and tools that will prevent you from blowing your budget, you’ve come to the right place! 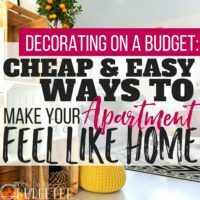 First things first, I have to be honest: if you’re trying to organize on a budget, you might not get the exact aesthetic you’re aiming for. You might not be able to create the perfect Pinterest-worthy closet setup or find the exact colors you’re hoping for. You may have to use a little elbow grease building your own items and customizing them yourself. But you know what? It is SO worth it!! Once your closet, schedule, house, and…life are even a little more organized, it will all look much better. A closet that’s sorted by color and sleeve length looks great, even if the hangers aren’t perfectly matching. A kitchen where everything is faced out and you can see what you have on hand looks nice even if it’s not filled with the latest and greatest cupboard organizing tools. So before you begin to search for organizing tools, keep in mind that being flexible and opting for function over style can really help you save. If tools are user-friendly and work, they will definitely help you improve your organizing game (even if they don’t look like they came from a designer). If you're ready to start organizing on a budget, here are my favorite clever organization tips to get you started! I love planners and the cute ones with great paper and darling stickers are very popular right now. That said, they can really add up. I saved for a few YEARS before I could bring myself to spend money on a fancy planner (and by that time I really knew what I wanted so I was able to get a perfect planner with the most bang for my buck). In the meantime, I made my own planner. One of the best parts of a DIY planner is that it’s totally customizable. You can find the types of sheets you prefer, the layout you like, and the tools that work for your budget, organizing style, and life. You can add a meal planner, a goal-setting tool, a budget tool—whatever you like! Is a DIY planner as fun as a fancy planner? Maybe not, but it’s very functional. You can make a cover that fits your style and for less than $5 you can create your own great planner that will last all year! Many people have mixed feelings about dollar stores. They’re great for some things, but the quality of items is often lacking, so for some items, they’re not such a great deal. Plus, the “everything’s a dollar” aspect can lead some people to a “buy more” mentality, which can result in lugging home ten things you don’t really need (even if it only cost $10 total). That said, when it comes to organizing tools, your local dollar store is your new best friend! They have hangers and containers and frames, as well as disposable party goods that are a great deal at $1 and are among the more high-quality items. You can find plenty of options for containing and organizing all your little stuff, like jars, vases, locker organizers, and more. Look for binders, trays, craft organizers and items like spray bottles and cleaning tools at the dollar store. There are tons of ways to customize the containers and find dollar store organizing ideas and projects that are simple and easy. When it comes to organizing, the dollar store is a great resource! Looking for DIY storage container ideas? Try repurposing items to help with organization! If you have any boxes, drawers, even old trunks and suitcases, you can easily turn them into storage items. Old tackle boxes, toolboxes and makeup organizers can be repurposed to contain doll clothes, toys and more. But what about items you would ordinarily just throw out? Well, many items make great DIY organizing tools. Try cleaning up jars or cans and covering them with some cute scrapbooking paper or contact paper. Cardboard boxes can be great for storage too, and can also be covered with contact paper if you want to spruce them up. Use baskets and pots to hold items like towels in the bathroom or to wrangle paperwork, pens, or other items that end up scattered about. So many items we normally just toss make great containers and organizers. Get creative! 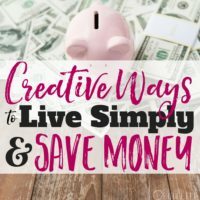 If you’re trying to get your budget organized, you could spend money on expensive tools, notebooks and more, or you could simply download some awesome free printables. There are printable tools for almost anything out there—labels, thank you cards, meal planners and of course, budgeting and planning. Will they be as pretty and fancy as the kind you’d find in a store or pay to download? Probably not, but for simple, basic options you can find all sorts of great tools out there. Use a binder from the dollar store to organize your printables or cover them with simple laminating sheets to use them over and over with a dry-erase pen. You can use programs like the HP Instant Ink program to ensure you never run out of ink, so you can print the sheets over and over! The next time you’re looking for something—storage bins, hangers, boxes, you name it—try checking out Craigslist, Listia or Freecycle. These sites can be a great resource and can help you find what you need for FREE! You can find all sorts of items (beyond just organizing tools) like sports gear, clothing, home and garden supplies and more. If you decide to use one of these services, just keep in mind that you’ll probably have to pick up the items or pay for the shipping. Look for bookshelves, bins, boxes, and even big items like chest freezers on these sites. You can up your organizing game without spending a dime! Similar to the free listing sites, neighborhood boards, groups and pages are another awesome resource for finding organizing supplies and more. The site Nextdoor is a neighborhood-based social network and many schools, churches and community groups also offer listings and pages where people can post items and exchange. Don’t limit your organizing to simply tools—many of these sites also list community classes and services where you can learn how to budget, be a better cook, or gain other important life skills to help you tackle problems that come your way. Many neighborhoods also have community centers or libraries where you can see listings for even more free tools, resources and items. Check out what your local area has to offer. When you’re looking for organizing items at thrift stores, try to think outside the box and find new uses for items. You might be able to repurpose something to give it a different life! Don’t forget to watch for rummage sales and garage sales around your neighborhood as well. Resist the urge to stock up on “one man’s trash” and buy things you don’t need. Be single-minded in your search and look for items to help you get organized! Want to know the best tip for getting yourself organized? Simply downsize! When it comes to organizing your closet, your cupboards, your kids' rooms or your home media center—downsize. Get rid of what you don’t need. When you have less stuff, there’s less to organize and less to deal with. You can find what you need because you aren’t busy searching through junk or feeling overwhelmed by an insurmountable mess. Downsizing is easier when you can make money doing it. Try selling your unnecessary clutter on eBay or host a garage sale to help motivate you to sort, organize, and let go. We all get attached to things. You don’t have to get rid of everything of course, but simply cutting back and buying less will help you get a handle on what assets you’re working with. Last year I got rid of my purse. I realized I was just hauling around a bunch of stuff I didn’t need and it was weighing me down. It was amazing once I stopped—I felt more organized because I wasn’t sorting through my bag looking past all the things I didn’t need for the one thing I couldn’t find. It was amazing. Getting organized is often all about mind over matter (literally). Keep yourself focused on bringing in less stuff and clearing out the clutter from your life. Use tools to help you become more organized and on top of things in general. What tips and tricks have you found for organizing on a budget? Do you have any budget-friendly strategies you use to stay on top of things? We don’t do any of the things above, but it’s a great list of ideas! We just use credit cards for everyday purchases and look at the total and detailed items if we think there’s something suspicious going on (i.e. expenses too high). We just decluttered our storage shed last weekend, and it felt great! I read this post yesterday prior to going shopping. As I looked through different aisles I looked at items differently and guess what? I found some great deals for organizing my home office and half bathroom. Thanks so much for always sharing useful information. Shoe boxes to match. I have several containers that I have bought from yard sales for storage. I usually paint them and some have moved from room to room as needed or if I find something that works better. My favorite new FREE way to organize spices: save the box(s) your mandarin oranges/clementines come in. Put all the spices in it and directly into your cabinet. Then you can easily bring it down to the counter and find what you need. No more shuffling through the cabinet to find what you need.